← A Sticker For Your Thoughts. Are you looking to become more involved in the community? Want to get to know some of the most interesting people you will ever meet? Perhaps you have lived here since before the village was built, or you may just be here for the season. The best way to get to know the community is to become a part of it by volunteering. Did you also know that volunteering is a great way of getting work experience? Walking dogs, exploring Whistler’s history, handing out food to those in need, volunteering for exciting events, or helping people to find their way around the village – there are so many ways that you can get involved and have a blast doing it! 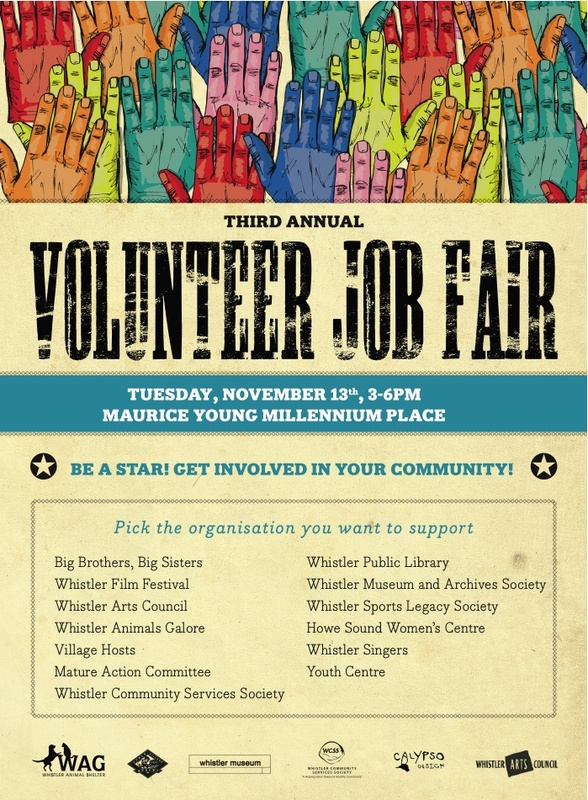 If you’re interested in volunteering, but aren’t sure what’s out there then come along to the third annual volunteer fair at MY Place, Tuesday, November 13th from 3-6pm. Representatives from 16 local groups will be there for you to meet, talk with and learn about all the diverse and interesting jobs that really need filling. There will also be free snacks and a door prize of a gift basket of yummy goodies, generously provided by Upper Village Market. This is a wonderful opportunity to make a difference in the community you are living in. Share your time and your talents to help a charity with the same passions you have. Volunteering is rewarding and fun! This entry was posted in News & Events and tagged charities, community, non-profit organisations, volunteering, volunteers, Whistler. Bookmark the permalink.